I haven't posted since before the summer. School started a couple of months ago now. There's lots going on. In September, we heard reports of two incidents of racism between ORCSD students. This news unfortunately coincided with reports of an attempted lynching of an eight year old by teens in Claremont and followed reports of racism at UNH. In Charlottesville in August "fine people on both sides" apparently included Nazis with Tiki Torches. All this on the fiftieth anniversary of Loving v. Virginia, the Supreme Court decision that ended all bans on interracial marriage in the US. The first incident involved two grade school students on the school bus from Mast Way September 1st. I believe I read the perpetrator, for lack of a better word, was reported to be in second grade though I cannot find that reference. The victim is the son of an interracial couple new to the district. They have gone public, which is the only reason we know of it. The policy of the district has been to keep these incidents quiet to protect the identities of children involved. There's an unreleased video of the incident that has been reviewed by the parents. The published accounts are pretty horrific. Verbal abuse included repeated taunts of “whites are over blacks” and “blacks are white's slaves” and what the victim's mother describes as "gorilla screams." She describes the physical abuse as "being continually hit with a baseball the child held in his hand and being hit with his backpack." She said the abuse lasted over 40 minutes. The original article also alluded to a second incident, some sort of racist jokes at the middle school. The report quoted a parent who claimed that the teachers and principal did not take the incident seriously, which I personally find hard to believe. But this does indicate that these issues have been handled separately in each school generally without involving the superintendent. In response to the recent incidents this has all changed, and the board is working on new policy to reflect this. The district's response has been pretty swift and widespread. They engaged New Hampshire Disproportionate Minority Contact Coordinator Andrew C. Smith to help with the effort. (The mouthful of a title refers to Mr. Smith's function to address the treatment of minorities by the justice system.) He is personally training all Oyster River teachers, staff and administration. Plans are in the works to make the training available to district parents and probably anyone else interested. On October 25th the district held a Diversity Forum chaired by Mr. Smith in the ORHS cafeteria. It followed the community supper, which was excellent thanks to Nutrition Director Doris Demers. This was easily the most well-attended district forum I've been at. The superintendent claimed there were over four hundred people in the room. The ten or so panelists each relayed personal stories about how discrimination had affected their family's lives. The format was innovative; instead of the audience asking questions of the panelists, they asked questions of us. One asked, "what do we not often share with others and why?" My table turned out to include a fair numbers of quiet atheists, who shall remain nameless. One person admitted to being a lawyer. 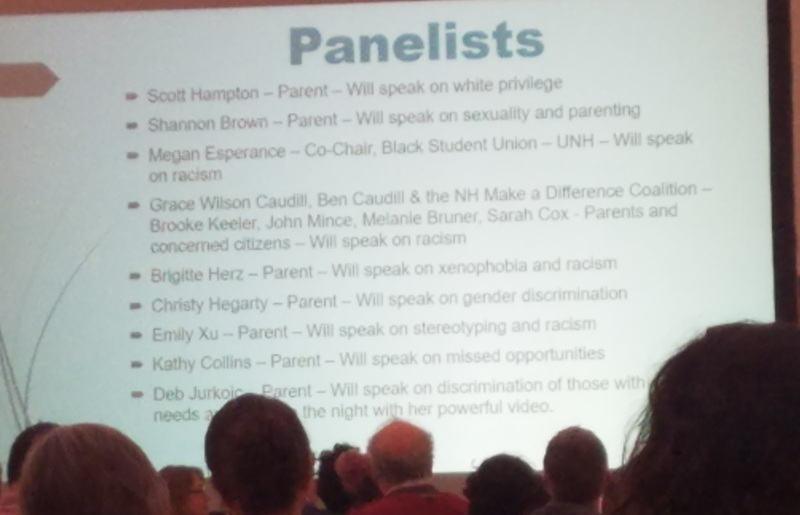 The forum was about diversity writ large rather than racism per se, which broadened the discussion to include sexism and special needs children being treated poorly. Asians are perhaps the largest minority in Oyster River and one parent lamented how her children's achievements are dismissed as all Asians are presumed to be smart. To me the most moving talk of the night came not from the panelists or Mr. Smith, but from Superintendent Morse himself. He shared his personal story of being called "poor white trash" throughout his youth; it's right at the beginning of the video above. The irony of course is that at the forum on diversity a white male stole the show. Two board meetings ago, former board member Krista Butts made a comment informing the board of a potential football cooperative opportunity with Portsmouth High School. At the last two board meetings a number of people spoke in favor of the football coop. For regular school board watchers it felt like deja vu; we've seen this before. Last March's ballot question, though mangled at deliberative session, seemed to indicate the will of the community is to not have football at Oyster River. While I hoped at the time this would put the issue to rest, I didn't think it would, and of course it hasn't. Ms. Butts claims the agreement with Portsmouth High addresses all the concerns the board had with the previous proposed cooperative agreement. These include a concern about Portsmouth ending the agreement when they change divisions. Apparently they did change to division one where they will stay, but they are still interested in the cooperative. The claim is once Oyster River signs our district is out of the loop. ORCSD would not be responsible for providing any money, transportation, insurance etc. to support the ORHS students that choose to participate. To my knowledge the agreement is not yet available for inspection by the public. (That means I spent a few minutes looking and didn't find it; if anyone has a link, please let me know, thanks.) So we can't really verify claims about the agreement just yet. There were a few issues that came up last time that a new agreement probably can't really address. The district is under extra scrutiny to obey Title IX, so essentially for every boy playing another sport we have to find a new girl athlete. This not only costs money but is difficult to do because at around a 75% participation rate it seems most people that wish to play sports at ORCSD are already doing so. One thing that scuttled the first cooperative agreement with Portsmouth was then board member Barth's question and then Athletic Director Parker's answer that a cooperative agreement was an indication to the NHIAA (who approves these agreements) that the district intends to seek a football program of its own once the cooperative ended. Maria's left the board and Corey's left the high school, but I'm pretty sure the superintendent and a few board members remember. The board could just not mention it again, or be honest in the application about their real motivations (the cooperative tries to satisfy all sides by allowing Oyster River kids to play at Portsmouth while keeping football out of Oyster River proper) and let the NHIAA decide. Chairman Newkirk mentioned a second proposed cooperative, this time with Dover HS. This was the first I'd heard of that. It didn't seem to me Ms. Butts was that interested in that one; the focus is still on Portsmouth. Dr. Bob Barth (husband of Maria) and board member Dr. Kenny Rotner spoke against football, citing health concerns, especially CTE. Bob got himself in a bit of trouble with his rhetoric, using "child abuse" and "Aaron Hernandez monster tragedies." From the discussion it seems pretty clear that board member Brian Cisneros is in favor of a football coop, board member Rotner is against and the remaining five are undecided. Member Williams couldn't make the last meeting. The board decided to wait until all seven were at the table before deciding how to proceed. My guess is that at the next meeting they will vote to authorize exploration of the agreements, with a deciding vote to come after a report from the athletic director and assistant superintendent. I'm not sure of the time frame involved. My recollection is the NHIAA requires a fair bit of lead time, so perhaps the final decision will be made before the year end. Here's the video of the 10/18 & 11/1 boards meeting. Public comments are at the beginning. Board discussion of football starts at 1:43:20 in the second video. A number of parents have made comments at school board against the new start time. The concerns cited include students more tired than before because they're starting their extracurriculars and homework later and thus staying up later. There is also concern that classes at the last period of the day are taking the brunt of the change, with increased absences as students deal with the new schedule. It's difficult to disentangle this issue with two others: the bus driver shortage and the issue of homework. The district plan for the new start time involved hiring an additional driver or two. Unfortunately this has coincided with a local and nationwide shortage of bus drivers. Despite intensive hiring efforts, the district has been operating with four fewer drivers than needed, contributing to long bus rides. If you ever wanted to be a bus driver, now's a good time to start. Some districts in Massachusetts are offering $30 an hour. Our district offers a pretty good wage and benefits. They're talking about offering to pay potential drivers during their CDL training period. The drivers are now being represented by a union, which has lengthened contract negotiations currently underway. The board is beginning to address the issue of too much homework, which at member Rotner's urging they promised to do when they made the start time change. A meeting with the Student Senate was postponed due to the wind storm closure, but this issue is sure to heat up in the next few months. The students and parents are currently being surveyed. I can report that my own daughter, now a sophomore, last year would come home from school and almost always fall asleep and have to be woken for dinner. This year, with the later start, that pattern is gone. Nonetheless she says she doesn't like the later start time; I think that may be a prevailing view among her peers. With daylight savings time ending yesterday, we're really going to feel the later start time now. For much of the long winter we'll have barely an hour of daylight left after school ends, and for most of that the kids will be on the bus. Quite a few parents spoke out against the way cell phones and mobile devices are being used in Oyster River Schools. The concerns were focused mostly on the middle school and somewhat on the elementary schools. The buses are a concern. The current policy is JICJ and the associated procedure document is JICJ-R. This non-R/R division is common. The board policy committee is charged with creating or updating policies. The administration creates the R document to detail their procedures to administer to policy. Usually the full board reviews both documents at the same time but only approves the policy, the non-R document. The various school handbooks are additional sources that are supposed to be consistent with the other documents. The board asked the policy committee to survey policies from other New Hampshire districts and to review our own cell phone / mobile device policy and and suggest changes. The current policy was modified last year and was generally agreed to be satisfactory for high school. School was closed for two days due to a wind storm on Sunday October 29th. Many parts of the district, especially Lee, had no power until Thursday evening. Many folks lost their cable, internet and phone service as well. Cellular service seemed to remain up throughout. The superintendent had a plan to turn this Thursday's teachers' workshop back into a regular school day. Member Day pointed out this is a four day weekend (Friday is Veteran's Day, no school) for which some families surely made plans to travel. That was persuasive and the board decided not to change the calendar. They did put the community on notice that they may reclaim the March or May teachers' workshop. The topic of Blizzard Bags came up. I had never heard the term. Apparently New Hampshire has a provision to have a snow day count as a school day. It requires teachers be standing by (presumably by telephone or online) and 80% student participation. While a few parents were enthusiastic about the idea, Assistant Superintendent Todd Allen seemed to indicate that the way Oyster River counts instruction time (990 hours not 180 days) meant that it probably wouldn't help us; he'll present details at the next meeting. Todd's remarks are 54:54 into 11/1 meeting. The district is poised to enter into a long term capital agreement with Siemens. There's nothing too surprising there; in fact I think we're just finishing up paying off the previous one. Siemens has been involved in capital improvements to the district buildings for the last five years, particularly those that increase energy efficiency. While exact details remain to be worked out, the district is considering a five to seven million dollar lease purchase agreement. Siemens will do that dollar value of capital projects over the next year or two and the district will pay them off through a ten year or twelve year lease at around half a million dollars a year. At the end of the lease the district owns the capital improvements. If this sounds like a bond, it pretty much is, with one crucial difference: the approval of the voters is not required to enter into these lease-purchase agreements. A bond that committed the district to payments of half a million dollars a year would require approval of 60% of the voters on election day. This deal requires the YES vote of four board members. Our history with Siemens is good so these projects will likely be fine. What I object to is the end run around the public for the financing.